Since returning to power in a shock election almost a year ago, Malaysian Prime Minister Mahathir Mohamad and his Pakatan Harapan (PH) government have seen some success in terms of the reforms and wider change they are seeking to promote. But a series of growing challenges, including the difficulties in getting specific policies underway, doubts about an impending transfer of power to Anwar Ibrahim, and the prospect of a future coalition between opposition parties, threaten to overwhelm the new government in the coming months and years. The new PH government, to its credit, has been moving ahead with some new reforms as well as addressing old challenges, including weeding out excessive corruption that took hold under former prime minister Najib Razak. These successes ought not to be overlooked, and Mahathir and other officials do have a point when they insist that less than a year is hardly enough time to even make a dent in addressing the full range of problems Malaysia faces. Nonetheless, a series of growing challenges are threatening to overwhelm the new government. First, difficulties in getting new policies underway are becoming more evident, and the number of instances where this has been the case has been rising. Among other things, previous ambitious promises such as one to abandon the death penalty and to fully prosecute individuals for corruption have not entirely borne out. Second, doubts continue to be cast about the Mahathir-Anwar transition. 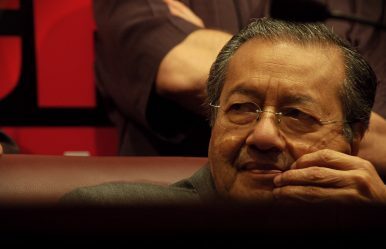 There seems to be little doubt that Mahathir is keen to live up to his pre-election promise by handing the reins to Anwar around this time next year (as one seasoned observer keenly noted to the author: “After everything that has happened, how could he not?”). But there are worries about those within Mahathir’s party that are not as wedded to the general idea as well as the specific timing of this. Insiders also fear that Anwar will steer his country further down an Islamic path in a bid to win over the Malay-Muslim vote in 2023, and that would upset some Malaysian states as well as minority Chinese and Indians. Third, the prospect of a widely-touted merger between Mahathir and Anwar’s former party the United Malays National Organization (UMNO) – ousted at last year’s poll for the first time since independence in 1957 – and the Malaysian Islamic Party known as PAS, remains a key challenge that lies ahead for the current government. There is the reality that the UMNO-PAS coalition could appeal to Malay-Muslims as well as segments of disaffected voters who are disappointed with the PH government’s performance and its multiracial appeal. And there is also the prospect that this could push the PH government to itself be less inclusive and more identity-based in an attempt to address perceived weaknesses. When taken independently, these three aforementioned challenges may be seen as not strong enough to pose a threat to the PH government. But taken together and viewed in a more cumulative sense, they are certainly sufficient to be taken seriously and to raise questions about how this will be addressed. Given that Anwar will likely have to contest the next election without the help of Mahathir, paying attention to these challenges and how they evolve in the coming months and years will be important to watch in the evolution of a New Malaysia.